A documentary filmmaker convinces the sole survivor of a mysterious mass suicide to revisit her former cult’s cursed compound. Compelled by cult leader Jim Jacobs, 47 members of the Church of Heaven’s Veil commit mass suicide on March 23, 1985 outside the town of Hidden Lake, California. 25 Years Later – Documentary filmmaker Maggie Price interviews lone survivor Sarah Hope, who was five years old at the time of the tragedy, about her time at the compound known as The Veil. Working from newly discovered photographs, Maggie convinces Sarah to help her locate missing film footage shot by Jones and his followers of their cult activities. Sarah accompanies Maggie and her film crew to The Veil. The crew consists of gaffer Nick, cameraman Matt, grip Ed, sound operator Jill, production assistant Ann, and editor Christian, who is also Maggie’s brother. On their way to the location, it is revealed that Maggie and Christian’s father led the FBI raid on the cult. Maggie later tells Sarah that her father committed suicide because of his work on Jim Jacobs’ case. Current property owner Mr. Wheeler cryptically acknowledges Sarah before begrudgingly allowing the crew through the gates. Ed goes missing after the first night at the compound. Christian reviews surveillance footage and finds seemingly supernatural shapes moving around Ed’s tent. With the crew’s van also missing, Nick and Ann are sent to walk 16 miles back to town for help. They later find Ed’s dead body behind the wheel of the crashed van before returning to tell the others. Sarah takes the rest of the crew across the lake to a hidden house where they find the cult’s secret films and videotapes along with a corpse. After watching a tape labeled “Experiment #23,” the corpse is identified as belonging to Karen Sweetzer, later discovered to be Sarah’s real mother. Over the course of reviewing multiple tapes and films, everyone learns that Jim Jacobs was experimenting with drug-induced astral projection. Jacobs eventually discovers a way to possess another person’s body. He also murders Mr. Wheeler in front of his followers only to bring the man back to life as proof of his newfound immortality powers. While alone, Nick is supernaturally attacked and killed by several syringes. His body becomes possessed and he murders Ann, who also becomes possessed. Jill and Matt find Ed seemingly still alive as they attempt to leave the camp. Matt keeps going on foot to find paramedic help for Ed. Jill is then drowned by Ed, who is revealed to be possessed by Jim Jacobs. Jill becomes possessed by Karen Sweetzer. Meanwhile, Ann stabs Christian in order for him to become possessed. Ann hands her weapon to Sarah. Unaware that cult members now possess everyone, Maggie watches footage with Sarah and the others from the day of the mass suicide. Jim Jacobs is revealed as Sarah’s biological father. Having proved that he could resurrect his followers to be immortal, cult members willingly swallow lethal poison, except for Karen, who is taken away to the hidden building when she tries stopping the suicides. The FBI raids the compound before Jim Jacobs’ acolyte can administer the antidote to bring everyone back from the dead. Maggie realizes her father is indirectly responsible for the cult’s deaths. Maggie discovers everyone is now possessed. Sarah injects her with a syringe. Maggie flees and eventually collapses while having a vision of Jim Jacobs and the cult. Matt returns with law enforcement. Matt sees a vision of Sarah promising that Jim will bring everyone back. All of the cops are suddenly killed and the cult is reborn into new bodies. No one knows how or why cult mastermind Jim Jacobs convinced four dozen followers to take their own lives. But in 1985, The Church of Heaven’s Veil did exactly that, leaving five-year-old Sarah as its sole survivor. 25 years later, documentarian Maggie Price is determined to discover the truth, and she needs Sarah’s help finding lost recordings that might solve the mystery. Sarah is reluctantly ready to revisit the former compound for the first time since the tragedy as Maggie’s film crew tags along. (“The Veil” is not “found footage.”) What none of them yet realizes is that even though Jacobs and his cult are dead, their curse most certainly is not. Take a look at footage of any motivated-to-murder cult leader considered notoriously enigmatic, e.g. Charles Manson, Marshall Applewhite, or Jim Jones. While madness is usually in plain view, charisma is often evident, too. Witnessing the ways they weave together preacher proselytizing, politician filibustering, and magician misdirection, it’s not impossible to imagine how effortlessly they were able to sway the susceptible, the brainwashed, the disenfranchised, and the disillusioned. That dangerous duality of being both savior and slayer is part of what makes these men frightening figures capable of creating concepts crazy to most, yet seemingly sensible to others. Thomas Jane doesn’t play that kind of complex cult leader in “The Veil.” He plays an outrageous madman movie villain. Thomas Jane’s performance as cult leader Jim Jacobs can be described by “more (blank) than (blank)” comparisons. Although his fictional biography and basic appearance is prototyped on the infamous Jonestown architect, Jane puts boozy rock star swagger into a persona oddly channeling far more Jim Morrison than Jim Jones. Jane determinedly curls every word with a sinister growl that would make more sense if he were in a Killer Croc costume trading punches with Batman than as a supposedly silver-tongued slickster selling salvation through self-destruction. Concrete sees more subtlety from a jackhammer than viewers do from Jane. Why does a talented actor like Jane choose to display Jacobs’ evil as so openly over the top that the performance comes back around to swallow itself along with scenery? For that, fault is found at the feet of director Phil Joanou, who is intent on taking a premise with chilling real-life parallels and dumbing it down into an extraordinarily basic movie indistinguishable from any milquetoast mainstream supernatural slasher. Count the number of times Lily Rabe, as cult survivor Sarah, is portrayed chain-smoking with folded arms or while staring through glazed eyes. Now count the number of times the runtime is padded and false fear is fabricated through a scene of someone creeping slowly across creaking floors while waving a flashlight over the lens. You’ll need both hands. Whether establishing atmosphere or a character, “The Veil” knows only one way to communicate any piece of information. That way is always overt, repetitive, uninteresting, or all three at once. I know of only one way to rate something so single-minded in its storytelling style. And that is as a movie too unimaginative to be anything other than average. Seven people are in a house watching one of the cult’s film reels when the power goes out. The group is already creeped out by the setting. Being steeped in darkness frays enough nerves that everyone suddenly needs a breather outside. They check the generator and find a busted spark plug. Replacement bulbs are inside the house where no one wanted to be when all seven of them were together. So of course, the most sensible COA is to send just one of the men back in alone while everyone else waits for the lights to go back on first. Guess what happens to the guy forced to go solo? Somehow, someone goes missing from the sixsome waiting outside and the others go on an impromptu manhunt for the mysteriously missing duo. Except for one person who stays behind at the generator because, well, because the script doesn’t have a better way to pull these people apart. Dumb horror movie characters doing dumb horror movie things? Nonsensical behavior isn’t disregarded by that cliché. This finger points directly at uninspired screenwriting. In defense of the script’s sluggishness, such laziness is in keeping with filmmaking that inserts a random 1978 flashback film, a creepy doll, an abandoned wheelchair, whispered chanting, and backstory bits like one of the crewmembers being Maggie’s brother without these elements having context behind their supposed scariness or payouts to their positioning in the plotline. 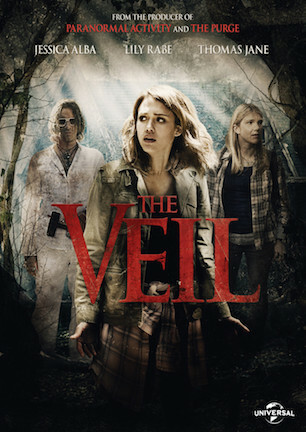 There’s a reason why “The Veil” debuted almost anonymously under the “BH Tilt” brand, a label whose latter word references what the Blumhouse dump truck does to quietly abandon titles like this, “Curve” (review here), and “Mockingbird” (review here) for drowning in VOD channels with only a brief genre news blurb or overlooked appearance in Netflix’s “Now Playing” as an obituary. If that reason isn’t apparent, the movie’s resoluteness in reiterating the obvious will hit it into your head with its hammer of blandness, like it does everything else. For legitimate killer cult thrills, indoctrinate yourself in Karyn Kusama’s “The Invitation” (review here) or Ti West’s “The Sacrament” (review here) instead. January 20, 2016 by Ian Sedensky.